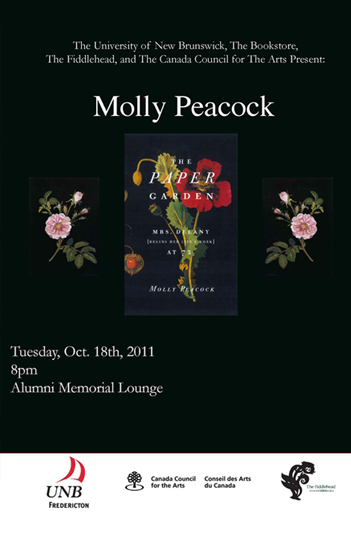 Celebrated author Molly Peacock will be reading from her new book, The Paper Garden: Mrs. Delany Begins Her Life's Work at 72 on Tuesday, October 18th, 2011 at 8pm at the Alumni Memorial Lounge on the Fredericton campus of the University of New Brunswick. Molly Peacock, a poet and a creative non-fiction writer, is the author of The Paper Garden: Mrs. Delany Begins Her Life's Work at 72 (2011), the life story of Mary Granville Pendarves Delany, the beautiful and talented daughter of a minor branch of a powerful family in the 18th century. Married at seventeen to a drunken, though wealthy, sixty-one-year-old man in the interest of improving the family fortunes, Mary would later cultivate a wide and influential group of friends, developing her artistic abilities and pioneering the art form of mixed-media collage in her wondrous cut-paper flowers. The 985 botanically accurate paper flowers, known as Flora Delanica, are now kept in the British Museum. Peacock explores the nature of creativity and art in this exceptional biography, and the book itself is beautifully designed and features thirty-five full-colour illustrations of Mary Delany's paper flowers. Molly Peacock has also published six books of poetry, including The Second Blush (2008), and Cornucopia: New & Selected Poems (2002). Her poems have appeared in The New Yorker, The Nation, The New Republic, The Paris Review, and The Best of the Best American Poetry. Among her awards are Danforth Foundation, Ingram Merrill Foundation, Woodrow Wilson Foundation, National Endowment for the Arts, and New York State Council on the Arts Fellowships. 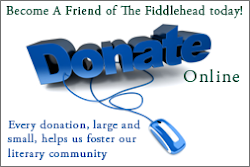 Canada's longest living literary journal, The Fiddlehead is published four times a year! Although we appreciate diversity and innovation in writing, the work we publish is also consistent in quality. 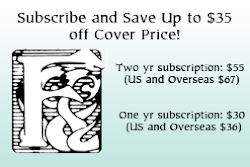 We are committed to exposing readers to the latest work produced by reputable and emerging authors. The Fiddlehead 249 is now out! Copyright: The Fiddlehead. Travel theme. Theme images by merrymoonmary. Powered by Blogger.